Marcus Gene McCutchan, a resident of Florence, AZ and Grand River, IA, died Saturday , January 5at the Phoenix Mayo Clinic. He was 82. Marcus was born on June 3rd, 1930 near Grand River, IA, the son of Leona and Emmitt Dalton McCutchan. In 1946, his family moved to Florence, AZ for his brother Hallie's health, where, in high school, he met the love of his life. 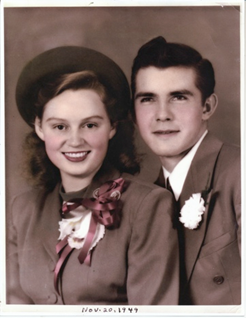 He and Sarah Aleene Rankin were married November 20th, 1949 - a marriage that was to last 63 years. Marcus served in the Army 1952-53, one year in Aberdeen, MD and one in Korea. Marcus was employed by the Arizona Water Company as a meter reader for Coolidge, Casa Grande & Florence. Later, he was promoted to meter repairman in the Coolidge shop. In 1962, AZ Water Company purchased the Sedona, AZ water system, then Marcus moved with his family to the small community of Sedona where he served as manager for 33 years, 38 yrs. in total. Among his many accomplishments, he served as president of the Arizona Water and Pollution Control Association, Chairman of the Arizona Water Pollution Control Federation - Arizona Chapter, National Director of the American Water Works Association where he was named water utilities operator of the year, listed in Who's Who, named to the Select Society of Sanitary Sludge Shovelers. He held advanced operator certificates for both sanitary and waste water operations. Service was a way of life, serving as the Secretary and President of the Sedona Chamber of Commerce, Keep Sedona Beautiful and Sedona's Rotary clubs (with 43 years of perfect attendance). He was a charter member of Sedona's Elks Lodge. Later in life, he purchased and operated the McCutchan farm property founded in 1853 in southern Iowa. Marcus liked to travel and with Aleene he traveled to all 50 states and 16 foreign countries. He is survived by his wife Aleene, his children, Greg (Kate) McCutchan, Kim (Mike) Moyer and his brothers, Hallie (Mildred) McCutchan and Kermit McCutchan. Services were held at the Kale Funeral Home and burial was in Hopeville, IA cemetery.